Your Novell Data Synchronizer administrator has set up a Synchronizer system to synchronize data from your Vibe system to your GroupWise system. Synchronization is primarily one way, from Vibe to GroupWise. Changes made to folders in Vibe synchronize to GroupWise, but changes made to the corresponding folders in GroupWise are not synchronized to Vibe, and are overwritten in GroupWise at the next synchronization. 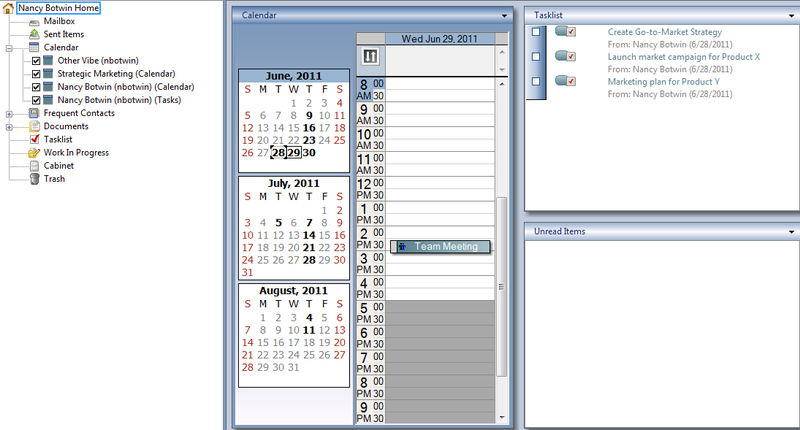 Synchronized Calendar folders and Tasks folders become sub-folders under your GroupWise Calendar folder. During initial synchronization, all qualifying calendar entries and task entries within the past 30 days are synchronized to GroupWise. The Synchronizer administrator can increase or decrease the number of days that are initially synchronized. If you are unsure why a particular folder is being synchronized to GroupWise, you can display the hierarchy of where the folder is located in Vibe, as described in Viewing the Vibe Folder Hierarchy and Permalink. Additions, deletions, and modifications made to Calendar folders in your personal and team workspaces. Non-calendar entries in Calendar folders are not synchronized. Additions, deletions, and modifications made to tasks that are assigned to you, to a team you are a member of, or to a group you are a member of. 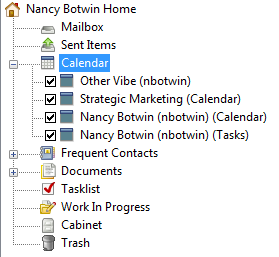 Removing a user’s access to a personal or team Calendar folder in Vibe causes the folder to be deleted from GroupWise. Folders are also removed from a user in GroupWise if the folder is moved to a location in Vibe where the user no longer has rights. All folders that are currently being synchronized from Vibe are displayed in the GroupWise Folder List as sub-folders under the GroupWise Calendar folder. Synchronized Calendar folders and Tasks folders reflect the name of the team or personal workspace where the folder is located in Vibe, with the name of the folder itself in parentheses. For example, the following figure shows the Vibe folders that are being synchronized to GroupWise for Nancy Botwin. One of the folders is Nancy Botwin (nbotwin) (Calendar). Nancy Botwin (nbotwin) is the name of Nancy’s personal workspace, and Calendar is the name of the Calendar folder within her personal workspace. If the calendar entry or task entry does not pertain to a team that you are a member of, the folder name in GroupWise assumes the name of the Vibe folder that contains the calendar entry or task entry that is being synchronized. You can see the full Vibe path to this folder as described in Viewing the Vibe Folder Hierarchy and Permalink. HINT:If you have two folders with similar names, you might want to modify the folder name in Vibe so you can more easily distinguish between the folders in GroupWise. The Other Vibe folder is created by the Vibe Connector to store calendar appointments and tasks that meet the synchronization criteria but are either located in folders where you do not have access rights to the parent workspace or folder, or that are located in a folder that is not a Calendar folder or a Tasks folder. For example, it is possible in Vibe to create a task in any type of folder, such as a Blog folder. Synchronized appointments are displayed as Busy in GroupWise if the appointment is explicitly assigned to you, to a team you are a member of, or to a group you are a member of. These types of appointments show up in GroupWise Busy Search. If you are receiving the appointment indirectly, because the appointment is located in the Calendar folder of a team workspace and is not explicitly assigned to you, to a group you are a member of, or to a team you are a member of, the appointment is displayed as Free in GroupWise. These types of appointments do not show up in GroupWise Busy Search. The Vibe Connector does not synchronize changes as they happen. Instead, it periodically checks for changes in Vibe. By default, synchronization occurs every 15 minutes. 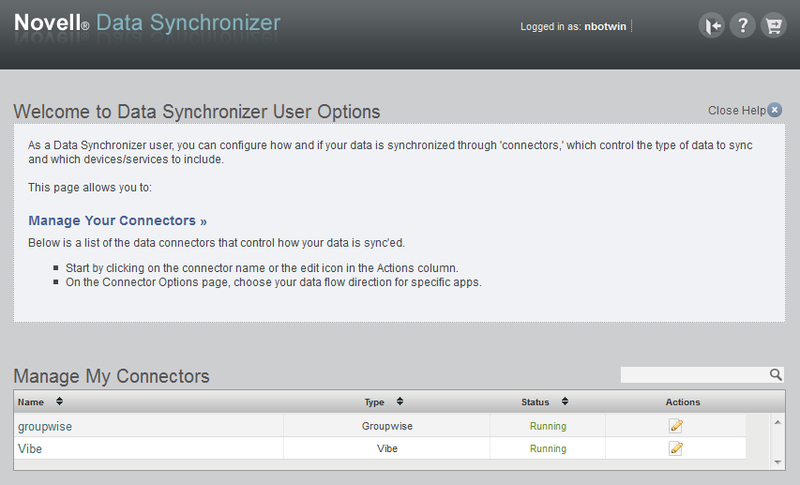 The Synchronizer administrator can make synchronization occur more frequently or less frequently. If you delete a calendar appointment or task in GroupWise that is being synchronized from Vibe, the item is restored to GroupWise at the next synchronization. However, if you delete a folder in GroupWise that is being synchronized from Vibe, the folder is deleted from GroupWise and it is not restored at the next synchronization. If you want to restore a folder to GroupWise after you have deleted it from GroupWise, you must reconfigure the folder to be synchronized by using the Folder Selection Administration tool, as described in Configuring Synchronization. All folders that are currently being synchronized from Vibe are displayed in the GroupWise folder list as sub-folders under the GroupWise Calendar folder. You can simultaneously display all calendar appointments and tasks, or you can view only calendar appointments and tasks that pertain to a specific folder. Click the main GroupWise calendar in the folder list. Deselect the Calendar folder or Tasks folder in the GroupWise Folder List. Calendar folders display calendar appointments in a calendar view. Tasks folders display tasks in a task list. Click the folder name in the GroupWise Folder List. In the Username field, specify the username that you use to log in to your network. Click on the line for the Vibe Connector. All (default): Synchronizes folder entries based on the criteria listed in Initial Synchronization. Assigned: Synchronizes only folder entries that are explicitly assigned to you. None: Disables synchronization for the folder so that no entries are synchronized. Right-click the folder in the GroupWise Folder List, then click Properties. The hierarchy and permalink are displayed in the Description section. Items that are synchronized from Vibe are displayed in teal blue. Right-click the Calendar folder or Tasks folder in GroupWise, then click Properties. On the General tab, next to the Color option, click the drop-down list, then select a new color. This modification is not overwritten at the next synchronization. However, if the folder is deleted in Vibe and then restored, the modified calendar color is not preserved. 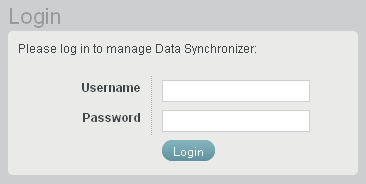 It is also not preserved if you deselect a folder from synchronizing and then reselect it by accessing your Data Synchronizer user account, as described in Configuring Synchronization. Setting a task status in Vibe to Cancelled, In Process, or Needs Action does not change the task status in GroupWise because these are not valid statuses in GroupWise. Completed is the only Vibe status that is synchronized from Vibe to GroupWise. Deleting the task in Vibe deletes the task in GroupWise. If you are subscribed to e-mail notifications for Vibe folders or entries that are being synchronized to GroupWise, you receive e-mail notifications for the folder or entry at the initial synchronization. Ignore these initial notifications. If you have not elected to receive e-mail notifications, you still might be subscribed to Vibe e-mail notifications if a folder owner has elected you to receive notifications. Copyright © 2011-2012 Novell, Inc. All rights reserved. No part of this publication may be reproduced, photocopied, stored on a retrieval system, or transmitted without the express written consent of the publisher. For Novell trademarks, see the Novell Trademark and Service Mark list. All third-party trademarks are the property of their respective owners.